Jesus said that the words we speak reflect the true condition of our hearts. Since every word we speak matters - for both today and eternity - it’s time to get a bit more hands-on about how we can ensure that our words are life-giving. KIND: Who doesn’t like a kind word? We all do. So before you speak, ask yourself: is what I’m about to say kind? If your words will unrighteously ruffle someone’s feathers, then it is better not to speak them. (There are times when words need to ruffle feathers. True enough. But they should still be kind, constructive, and God-honoring.) If what I am about to say is unkind, then it fails the KUT test and I zip my lip. No talky. USEFUL: Oh, how we can complain and vie for control. Our expectations of others can stir us up: we think we know how they should act, communicate, behave, respond, and dress. The truth of the matter is, we cannot choose behavior for others, but we can choose for ourselves. When my buttons are pushed I have several choices. I can choose to be sassy and destructive. I can choose not to respond and engage in the argument. Or I can choose to respond in kindness that has the potential to calm a flustered heart. See? Lots of options. But my best choice is to pray first, then choose my response. Even just a whispered prayer, Lord, please give me your wisdom and grace for this moment! Filter my words and calm my heart. TRUE: Let me jump on this one right away with a qualifier: just because something is true does not mean it is wise to say it. Here’s why. What I have to say might be true, but if it is neither kind nor useful, then—in most cases— it does not need to be said. So, truth is not reason enough to say something. The Bible says that our words are to “benefit” those to whom we speak (Ephesians 4:29). Truth must be spoken in light of both wisdom and grace. Jesus prayed that God would sanctify us in his truth, which is the Word of God (John 17:17). And that, friend, is the best thing for us when it comes to our words. Our words need to be sifted through God’s truth. If what we are about to say does not line up with Scripture, then we simply should not say it. Kind. Useful. True. Obviously this is not an exhaustive list of guidelines, but it is a great, easy-to-remember tool that can help train us to have a biblical mind set as we learn to be positive and productive in our conversations. The KUT test helps to sift out words of anger, hurt, negativity, rudeness, arrogance, prejudice, ignorance, and foolishness. And so much more! It’s like a Brita for your mouth! I’d call that productive, wouldn’t you? I really need your help with this one. I want all of my conversations to be positive and constructive . . . led by your kindness . . . useful and true. Please help me to be quick to listen, slow to speak, and slow to anger. What are a few of the phrases that fly from your mouth that are not kind, useful, or true? 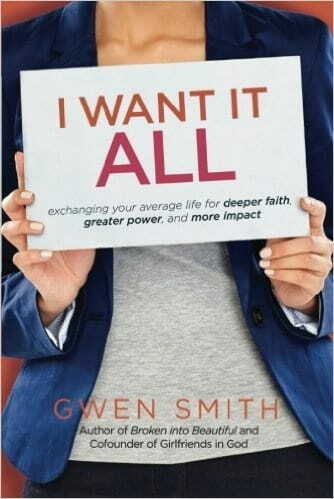 Today’s post is an excerpt from Gwen Smith’s book, I Want I ALL, which includes a Bible Study Guide right in the back of the book; no extra purchase required. I WANT IT ALL is easy to read yet contains compelling and challenging content. You'll connect with the stories, probably dust off a few heart dreams, think bigger thoughts of God, laugh and smile a lot, search your soul, and even cry a little ... because each page lovingly directs you to the personal grace and truth of JESUS.